As you know, Buddhism is a religion based on the teachings of Buddha and, nowadays, it’s the fourth most widely practiced religion in the world. Since its origin, Buddhism has undergone different divisions, much of them have founded different schools of Buddhism. Despite of the several branches and their main concerns – moral, doctrinal interpretation, metaphysics, meditation technics and philosophical debates (to name a few) – today, the four major schools of Buddhism are Mahayana, Theravada, Vajrayana and Zen Buddhism. So, let’s take a closer look to each of them, keeping in mind that the main ideas of Buddhism are meditation, practicing compassion, studying sacred text, and renouncing desire. The term Mahayana is a Sanskrit word which literally means “Great Vehicle”. It’s one of the largest schools of Buddhism and is most prominent in North Asia, including Tibet, Japan, Korea and China. According to the information we gathered, many practitioners of this school believe that following the Mahayana teachings will bring them a higher level of spiritual awakening than other Buddhist teachings. And which are those teachings? Mahayana Buddhists commit themselves to achieving mindfulness and have faith in Buddha. However they do not worship Buddha as a person, but as a deity, a wide force. They consider that there have been many enlightened ones, many Buddhas, reason why they have this theistic vein and don’t pray to a single man. The upaya – this an open-minded acceptance of anything that is able to bring others to the spiritual maturity. “However innumerable the sentient beings, I vow to save them all. However inexhaustible the passions (klesas), I vow to extinguish them all. However immeasurable the dharmas, I vow to master them all. 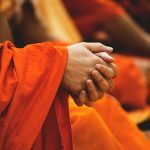 Theravada literally means “Teaching of the Elders” and is the dominant form of Buddhism in Myanmar, Cambodia, Laos, Sri Lanka and Thailand. Historically, it derives from a Buddhist school no longer existent named Sthaviravada. One of the key features of this Buddhist school is the use of Pali as a sacred language and the Pali Buddhist canon (Tipitaka) as the highest scriptural authority, which was written around the first century BCE. Theravadin Buddhists teachings are usually referred to as sutras. They aspire to a perfect state of enlightenment, or nirvana. Nirvana comes with the recognition that the ego is an illusion that causes us and others pain and suffering. For Theravadins, attainment of nirvana ends a cycle of birth, death, and rebirth characterized by this pain and suffering. 1. Sotapanna: meaning ”one who enters the stream”, a person who realizes that he lives under an illusion and catches a glimpse of the true path. 2. Sakadagamin: meaning ”one who returns once”, a person who has shed many of his attachments to worldly things and who will only have to be reborn once more before he can achieve nirvana. 3. Anagami: meaning ”one who never returns”, a partially enlightened person who will not return to the human world after death, but exist among other partially enlightened beings. 4. Arhat: meaning ”one who is worthy”, an enlightened one who will never again be reborn. Vajrayana means “The Vehicle of the Thunderbolt” and is grounded on principles of the Mahayana tradition. However, they have added esoteric elements to it and a very complex set of rituals compared with the rest of the schools of Buddhism. Also known as Tibetan Buddhism, there is a particular focus on the role of the master, who uses different tools including breathing techniques and many forms of yoga exercises in order to help the disciples to gain enlightenment. Vajrayana buddhists teach mainly the path to enlightenment. The rites are often meditation that includes tantric practices, combining the physical and spiritual worlds. They incorporate a series of loud sounds of trumpets and the strong smell of incense in order to stimulate the senses. The most sacred space for this school of Buddhism is generated inside the mind of the individual, through meditation. It is considered that only in such place the interaction with the Buddhas and bodhisattvas is possible. Symbolic ritual gestures, known as mudras, often done with the hands and fingers but sometimes with the entire body, including yoga techniques and breath control. Zen Buddhism entered Japan from China and focuses almost entirely on a specific form of meditation that claims to lead to a higher level of enlightenment. One of the core ideas of Zen Buddhism is that everyone has the potential to become enlightened and that the way to achieve such a goal is through meditation. Preconceptions and attachments are obstacles to achieve this kind os awareness and meditation helps to wipe them away. In other words, the pure original Buddha nature is present in everyone but we are polluted by ignorance and mental impurities. The role of meditation is so important in Zen Buddhism that the attention to rituals, scriptures and other doctrinal material is of very little importance.